Jerome McKinley Henderson Jr. was born December 9, 1987 in Caldwell. His father, a guard for the Celtics during the early years of the Larry Bird era, was winding down his career. 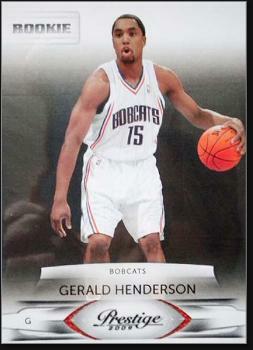 The Henderson family moved to suburban Philadelphia after he signed a contract with the 76ers, and that’s where Gerald grew up. Naturally, he was attracted to basketball because of his dad, and became a top shooting guard for Episcopal High School in Merion. He was also an all-conference golfer and high jumper. Gerald and his backcourt mate, Wayne Ellington, were both highly recruited by top national programs. Wayne signed with UNC while Gerald opted for Duke. Gerald warmed Mike Krzyzewski’s bench as a freshman in 2006–07, then took over a starting guard slot as a sophomore. In his junior year, Gerald led the team with a 16.5 average and helped the Blue Devils win the ACC Tournament and snag a #2 seed in the NCAA Tournament. He was a third-team All-American and first-team All-ACC. Duke was upended in the regional semis by Villanova, which went on to the Final Four—where the Wildcats lost to Ellington’s Tar Heels. The Tar hells won the national championship two days later. Gerald decided to skip his senior season and entered the NBA Draft. He was taken with the 12th pick in the first round by the Charlotte Bobcats. Gerald earned a starting job midway through his second NBA campaign, and had a breakout year in 2011–12. He averaged 15.1 pints per game on a team that finished with the most losses in league history. The following year he had a pair of 35-point games in March and again finished with a 15-point scoring average. In 2014–15, the team changed its name to Hornets. Gerald, in his 6th NBA season, found himself in a battle for playing time with rising star Kemba Walker and newcomer Lance Stephenson.